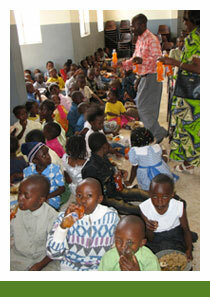 The social and humanitarian work of Faraja is implemented by the Faraja Foundation. With these programmes, we are supporting people to (re-)build a sustainable livelihood. The services are offered to needy and socially disadvantaged individuals and families. Apart from humanitarian aid, psychosocial support, training and entrepreneurial mentoring, the work of Faraja Foundation also includes a special programme for prisons. Initiated by our founder, who serves as a Chaplain in several prisons of Nairobi, we are running a comprehensive programme to drive improvements in the Kenyan penal system and in the rehabilitation and reintegration of offenders. An important element of the prison work of Faraja Foundation is that the services are not offered exclusively to inmates. For many years, Faraja has worked intensively with the prison staff. In training workshops, prison officers are sensitized for psychosocial issues such as violence, alcohol and drug abuse or sexual harassment. They are equipped with some basic skills to deal with these issues which are often present in their daily life in a prison environment. In addition to this, Faraja offers counselling support to both inmates and officers in selected prisons. For inmates, Faraja has established a number of training and activity programmes. This is a key component especially in remand facilities, where inmates are not allowed to work. Various courses – ranging from ITC to textile design or drawing and painting – are offered also in women and youth prisons. In addition to offering courses, Faraja has equipped several prisons with classrooms or sports grounds and improved sanitary installations. Outside prison walls, Faraja is offering humanitarian and psychosocial support to people who are stranded in life – often as a result of a personal tragedy. Such people may be ex-prisoners but also single mothers, orphans, sick or old people, internally displaced persons or refugees. Faraja supports these people with emergency humanitarian aid and start-up support or business boosts for income generation activities. All clients are accompanied and mentored by Faraja’s own social workers and counsellors. Finally, Faraja Foundation offers young people training and education opportunities. Initially, the focus thereby was on scholarships for secondary education. However, this focus has recently shifted to more practical and entrepreneurial vocational training courses. The reason for this is to be seen in the fact that even well trained secondary school leavers have challenges to find a job in the formal economy. Yet, at the same time, technical skills of blue-collar workers are often inadequate and there is a high demand for well trained craftsmen and –women. With its increased focus on vocational training, Faraja Foundation has developed a unique approach which differentiates the organization clearly from the many projects that focus almost entirely on sponsoring academic courses. For further information as well as current news about Faraja Foundation, please check their website www.farajafoundation.or.ke.